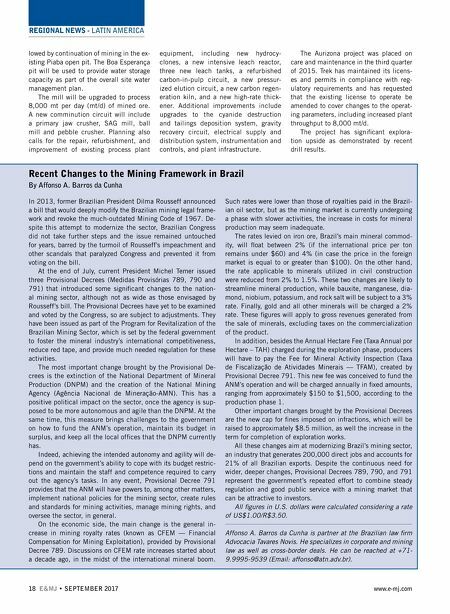 REGIONAL NEWS - LATIN AMERICA 18 E&MJ • SEPTEMBER 2017 www.e-mj.com In 2013, former Brazilian President Dilma Rousseff announced a bill that would deeply modify the Brazilian mining legal frame- work and revoke the much-outdated Mining Code of 1967. De- spite this attempt to modernize the sector, Brazilian Congress did not take further steps and the issue remained untouched for years, barred by the turmoil of Rousseff's impeachment and other scandals that paralyzed Congress and prevented it from voting on the bill. At the end of July, current President Michel Temer issued three Provisional Decrees (Medidas Provisórias 789, 790 and 791) that introduced some significant changes to the nation - al mining sector, although not as wide as those envisaged by Rousseff's bill. The Provisional Decrees have yet to be examined and voted by the Congress, so are subject to adjustments. They have been issued as part of the Program for Revitalization of the Brazilian Mining Sector, which is set by the federal government to foster the mineral industry's international competitiveness, reduce red tape, and provide much needed regulation for these activities. The most important change brought by the Provisional De- crees is the extinction of the National Department of Mineral Production (DNPM) and the creation of the National Mining positive political impact on the sector, once the agency is sup- posed to be more autonomous and agile than the DNPM. At the same time, this measure brings challenges to the government on how to fund the ANM's operation, maintain its budget in surplus, and keep all the local offices that the DNPM currently has. Indeed, achieving the intended autonomy and agility will de- pend on the government's ability to cope with its budget restric- tions and maintain the staff and competence required to carry out the agency's tasks. In any event, Provisional Decree 791 provides that the ANM will have powers to, among other matters, implement national policies for the mining sector, create rules and standards for mining activities, manage mining rights, and oversee the sector, in general. On the economic side, the main change is the general in- crease in mining royalty rates (known as CFEM — Financial Compensation for Mining Exploitation), provided by Provisional Decree 789. Discussions on CFEM rate increases started about a decade ago, in the midst of the international mineral boom. Such rates were lower than those of royalties paid in the Brazil- ian oil sector, but as the mining market is currently undergoing a phase with slower activities, the increase in costs for mineral production may seem inadequate. The rates levied on iron ore, Brazil's main mineral commod- ity, will float between 2% (if the international price per ton remains under $60) and 4% (in case the price in the foreign market is equal to or greater than $100). On the other hand, the rate applicable to minerals utilized in civil construction were reduced from 2% to 1.5%. These two changes are likely to streamline mineral production, while bauxite, manganese, dia- mond, niobium, potassium, and rock salt will be subject to a 3% rate. Finally, gold and all other minerals will be charged a 2% rate. These figures will apply to gross revenues generated from the sale of minerals, excluding taxes on the commercialization of the product. In addition, besides the Annual Hectare Fee (Taxa Annual por Hectare – TAH) charged during the exploration phase, producers will have to pay the Fee for Mineral Activity Inspection (Taxa AM), created by Provisional Decree 791. This new fee was conceived to fund the ANM's operation and will be charged annually in fixed amounts, ranging from approximately $150 to $1,500, according to the production phase 1. Other important changes brought by the Provisional Decrees are the new cap for fines imposed on infractions, which will be raised to approximately $8.5 million, as well the increase in the term for completion of exploration works. All these changes aim at modernizing Brazil's mining sector, an industry that generates 200,000 direct jobs and accounts for 21% of all Brazilian exports. Despite the continuous need for wider, deeper changes, Provisional Decrees 789, 790, and 791 represent the government's repeated effort to combine steady regulation and good public service with a mining market that can be attractive to investors. All figures in U.S. dollars were calculated considering a rate of US$1.00/R$3.50. Affonso A. Barros da Cunha is partner at the Brazilian law firm Advocacia Tavares Novis. He specializes in corporate and mining law as well as cross-border deals. 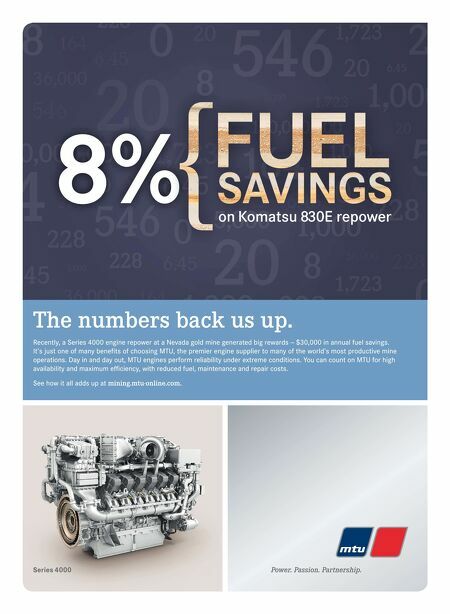 He can be reached at +71- 9.9995-9539 (Email: affonso@atn.adv.br). Recent Changes to the Mining Framework in Brazil By Affonso A. Barros da Cunha lowed by continuation of mining in the ex- pit will be used to provide water storage capacity as part of the overall site water management plan. The mill will be upgraded to process 8,000 mt per day (mt/d) of mined ore. A new comminution circuit will include a primary jaw crusher, SAG mill, ball mill and pebble crusher. Planning also calls for the repair, refurbishment, and improvement of existing process plant equipment, including new hydrocy- clones, a new intensive leach reactor, three new leach tanks, a refurbished carbon-in-pulp circuit, a new pressur- ized elution circuit, a new carbon regen- eration kiln, and a new high-rate thick- ener. Additional improvements include upgrades to the cyanide destruction and tailings deposition system, gravity recovery circuit, electrical supply and distribution system, instrumentation and controls, and plant infrastructure. The Aurizona project was placed on care and maintenance in the third quarter of 2015. Trek has maintained its licens- es and permits in compliance with reg- ulatory requirements and has requested that the existing license to operate be amended to cover changes to the operat- ing parameters, including increased plant throughput to 8,000 mt/d. The project has significant explora- tion upside as demonstrated by recent drill results.